Wargames Foundry has their Foundry Paints now available again, being re-released over on their new website. Wargames Foundry have now made available their entire range of paints on the new website. The Foundry painting method uses three shades of each colour: building up in layers from dark to light to easily achieve a realistic three dimensional shaded effect without the need for blending. The paints come in 20ml pots and can be purchased individually or in palettes of three, which include a base colour, a shade, and a highlight. Along with the paints, the Foundry Paint Sets are also available to order from the website again. 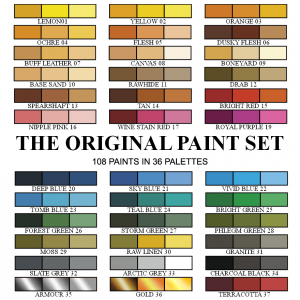 For the first time, and with the exception of the starter set, these paint sets are available with or without brushes. This makes them much better value for those who already have brushes. Foundry have also added a new Tryout Pack, consisting of 10 paints at a reduced rate.